It’s officially Spring, the daffodils are waving at me through the window, so I think I’ll start this blog with a joke…stolen from Seth Godin in his book “Permission Marketing”. ‘What do you get if you cross and insomniac with a dyslexic and an agnostic? Someone who stays up all night worrying about whether there really is a dog’. It’s a good joke the first time around. If you hear it for a second time? You probably won’t even smile. This is a bit like regurgitating the same content on your website or leaving your content to stagnate. Not many people will come back and check you out again if they keep getting the same old stuff. You have to continually offer fresh and interesting content to keep your followers happy and encourage them to share your message. As a digital marketing consultant, I try my best to keep up with all the changes – no, make that evolutions – that happen daily in the digital media space. I read constantly, follow other blogs, go to conferences and try out new social media tools to refine my digital strategy and knowledge. But for all the tools and techniques available, they are just that – tools for distributing great content. Content marketing has become one of the key online marketing tools to help businesses promote themselves in a crowded digital market place. So, can I quote from Bill Gates and say “content is king”? You can dispute this, but here are 10 reasons why I really think this is still true. The place to be discovered is on Google. Google loves content. Search engine optimisation is critical to create sustainable and long-lasting good search rankings and content has become a primary way to obtain safe and powerful links. You may have Twitter, Facebook and Pinterest accounts. But what are you going to say on them? If you only offer a stream of sales tweets and messages, you will lose followers and engagement. You need to offer people something of value to read and interact with. Socially shareable content from your blog will increase click through rates and may boost sales as a result. People have to get to know and like you before they buy. 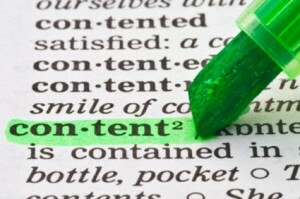 Creating regular content is a great way to engage with your customers and create buy-in. Keep content fresh and they will come back to visit you for more. A well run blog can be a sales tool, as can offering white papers, company presentations, webinars, videos. Consumers learn to trust and value your brand. Newsletters and promoting blog posts are a great way to engage by offering insights, relevant news and industry updates. Make them interesting and informative and people will happily sign up. I do! These are subtle sales techniques but also add value. It can help you to demonstrate your expertise in your industry or sector. If you are providing useful, actionable information and content, people will share it, recommend you and endorse you. All of which builds your brand. Taking time to create and share great content is not a quick process. It takes time to build a following of your target audience. It’s akin to building a network in the physical world. You have to commit time and effort into attending networking events and making a contribution to get the benefit. Just handing out your business cards and adopting a selling approach is like sending out constant sales Tweets – very few people will listen or respond. If your content requires a call to action or invites a response or reaction, then you will receive comments and feedback. This is a great way to test of you are reaching the right audience but it also help you to improve your content and widen its appeal. You are what you write. You write in your own style, in your own words, supported by your own research. This becomes your personal online brand and your authentic voice. Your audience will appreciate this and buy into your approach. You will find and attract like-minded content creators who will share your output but also engage in discussion with you. Getting known within a community will widen your reach. Understanding how to use social media, creating online campaigns and measuring your impact are all essential tools in your marketing kit bag but they are only there to widen the impact and reach of your valuable content. To sum this up, I love this quote from Doug Kessler, a content marketing guru.